After being brought off the bench on 65 minutes, the Banbridge man drilled home the opener before Joe Gormley’s deflected free-kick restored parity. 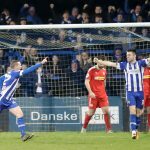 However as the match was entering added time, Burns arrowed a delightful winner into the top corner to ensure Oran Kearney’s men have maximum points from their opening two Danske Bank Premiership fixtures. “It’s just one of them shots that you know is going to hit the net,” Burns said. “I remember Stevie passing the ball into me and I had to re-adjust my feet, when I turned there was no-one near me and it was great to see it go in. “I thought Cliftonville were very good and they’ll be disappointed with us beating them. “They were on the front foot in the first 20 minutes and had a few chances, but so did we. 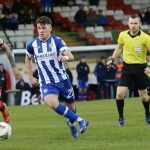 Burns hopes his match winning contribution will earn a starting berth moving forward but knows it’ll be tough as there are four quality strikers at The Showgrounds. “Fingers crossed it earns me a start gives Oran a few problems,” he added. 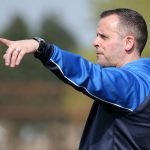 “He called the four strikers to the side last week and said ‘look we have four quality players here and two of you are going to have to miss out’. “Obviously James is injured at the minute, but you know that if you’re on the bench you have to come on and try and make an impact and give the manager a sore head and thankfully that’s what I’ve done. “Oran told me to go on the pitch, play your own game and try and make an impact. “Over my career I’ve had a wee knack of the ball just falling to me and there were three or four times in the first-half where the ball bounced about in the box and I was thinking that I would have buried that. “The one that did fall to me, thankfully I was able to take it. “On the bench you’re always thinking you can make an impact, but you also have faith in Jamie or Skinner to nick us a goal. The January signing from Linfield had further reasons to celebrate this week as he and his partner Hannah celebrated the birth of their son, Asher. “It’s been a fantastic week for me,” he revealed. “The wee man coming last week was an unbelievable experience and its love you just don’t know until it arrives. “There hasn’t been too much sleep but the mother and baby are fine and that’s all that matters. Burns heaped praise on his team-mates for grinding out another terrific result on the road and believes they would have lost that match two or three years ago after Gormley’s equaliser. “The mentality in our changing room is massive and we didn’t have Stephen O’Donnell, Lyndon Kane and James McLaughlin,” Burns concluded. “We’re still churning out results and I’d say two years ago once Cliftonville equalised, we would’ve likely got beat.